Available from approx. 27 July 2018. Limited Stocks. 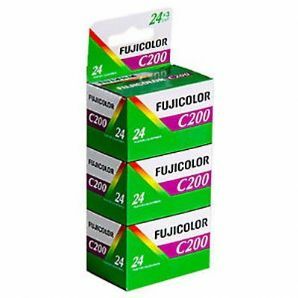 Fujicolor C200 is an excellent quality film of medium speed ideal for general purpose photography where the finite characteristics of the Pro films is not required. This competitively priced range film is robust and as such is also ideal for travel photography. Expect the typically forgiving exposure latitude associated with modern colour negative film. C200 differs to the discontinued Superia 200 in that it does not have the "4th colour layer" which was primarily designed to combat the defective colour spectrum of florescent lighting.